Pick And Drop Services ,Call For Best Offer. Pick & drop service available for site visit. 0% brokerage & Best Deals Guarenteed! Wadhwa Wise City in Panvel, Mumbai Navi by The Wadhwa Group is a residential project. The project offers Studio Apartment and Apartment with perfect combination of contemporary architecture and features to provide comfortable living.  The size of the Apartment ranges in between 387.5 sq.ft. and 645.84 sq.ft. The size of the Studio Apartment ranges from 289.0 sq.ft. to 310.0 sq.ft. Wadhwa Wise City price ranges from 23.95 Lacs to 58.06 Lacs. Wadhwa Wise City offers facilities such as Gymnasium and Lift. The project has indoor activities such as Squash court. It also offers services like Community hall, Garbage disposal and Library. This is a RERA registered project with registration number P52000016199. Bank loan approved from PNB Housing Finance Limited. It is a new launch project with possession offered in Jul, 2025. The project is spread over a total area of 138 acres of land. The construction is of 31 floors. Wadhwa Wise City brochure is also available for easy reference. Mumbai can attribute its real estate market positivity to a number of factors. Economic growth, rise in the population, increasing affordability of buyers, better regulations etc. are some of the major factors impacting the real estate market of the city. The consumer affordability in Mumbai has seen a positive shift in recent years, generating demands for investment as well as end-use properties. The appreciation in the price of the property has witnessed an upward trajectory in the realty market. In which area is Wadhwa Wise City located?The project is situated in Panvel, Mumbai Navi. What are sizes of apartments in Wadhwa Wise City? The apartment sizes in the project range from 390.0 sqft to 645.0 sqft. What is size of 1 bhk in Wadhwa Wise City? 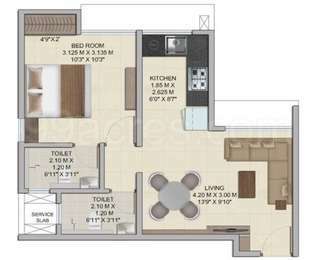 The area of 1 BHK apartments ranges from 390.0 sqft to 530.0 sqft. What is the area of 2 bhk in Wadhwa Wise City? The size of a 2BHK unit in the project ranges from 493.0 sqft to 645.0 sqft. What is total size of Wadhwa Wise City?The project is built over an area of 138.0 Acres. What is price of 1 bhk in Wadhwa Wise City? 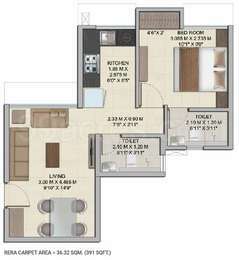 1 BHK apartments in the project are available at a price of Rs. 3229660 to Rs. 3399012.5.
he elements of light, height, and air. Today, the group's clientele comprises of over 20,000 satisfied customers and over 100 MNC corporate tenants. In every endeavor, The Wadhwa Group has been commended for its proficient execution and professionalism and is one of the most preferred developers for all its stakeholders. As an organization, the group is also known for its employee-friendly and professional working environment. Over the years, The Group has received many awards for both its commercial as well as residential projects. Among them are accolades at the 'Asia Pacific Property Awards 2013-2014' and the 'International Property Awards Asia Pacific?.The Capital and Platina at BKC are among their noted commercial projects and The Address Ghatkopar, Anmol Fortune Goregaon, Solitaire, Powai and Aquaria Grande Borivali are some of their well-known residential projects. What are the future prospects of investment in Wadhwa Wise City? Please assist. Hi Karun! I agree with Prerna, But if you are looking to buy an apartment in Wadhwa Wise City for end use then you should consider the fact that it is an under developed area and will take another 5 to 6 years to be fully developed. This area lacks public transportation and other civic facilities. Therefore, if you want immediate gains then it would not be a good idea to invest in this project. However, if you can wait for 5-6 years for all the infrastructure to develop then you can consider investing in this project. Hi Karun! There has been an increment in the property rates of Wadhwa Wise City by 2%. With metro proposed in Navi Mumbai in the coming 3-4 years time, it is anticipated to witness an appreciation in the capital values . In addition, Navi Mumbai Airport work is going on which will further boost property rates in this area. However to be completely sure I will recommend you to get in touch with a real estate expert before investing in this project. Has the builder incorporated any senior citizen specific facilities in Wadhwa Wise City? Hi Ujwal! Wadhwa Wise City will have parks, yoga and meditation area and senior citizen sit-out. Apart from that, Jay Hanuman Mandir Shedung is 3 km, and Sree Karteshor Mandir is 2 km from this society. Mangal Murti Clinic is 3 km from this society. Also, Sadguru Medical store is just 3 km away.